Rhesus monkey rhadinovirus (RRV) is one of the closest phylogenetic relatives to the human pathogen Kaposi sarcoma-associated herpesvirus (KSHV)—a gamma-2 herpesvirus and the etiologic agent of three malignancies associated with immunosuppression. In contrast to KSHV, RRV displays robust lytic-phase growth in culture, replicating to high titer, and therefore holds promise as an effective model for studying primate gammaherpesvirus lytic gene transcription as well as virion structure, assembly, and proteomics. More recently, investigators have devised complementary latent systems of RRV infection, thereby also enabling the characterization of the more restricted latent transcriptional program. Another benefit of working with RRV as a primate gammaherpesvirus model is that its efficient lytic growth makes genetic manipulation easier than that in its human counterpart. Exploiting this quality, laboratories have already begun to generate mutant RRV, setting the stage for future work investigating the function of individual viral genes. Finally, rhesus macaques support experimental infection with RRV, providing a natural in vivo model of infection, while similar nonhuman systems have remained resistant to prolonged KSHV infection. Recently, dual infection with RRV and a strain of simian immunodeficiency virus (SIV) has led to a lymphoproliferative disorder (LPD) reminiscent of multicentric Castleman disease (MCD)—a clinical manifestation of KSHV infection in a subset of immunosuppressed patients. RRV, in short, shows a high degree of homology with KSHV yet is more amenable to experimental manipulation both in vitro and in vivo. 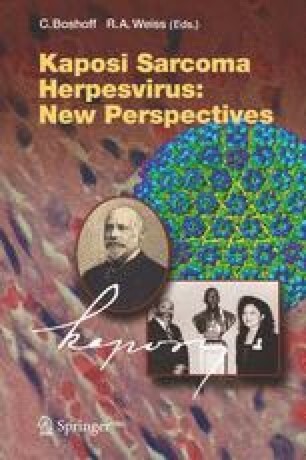 Taken together, these qualities ensure its current position as one of the most relevant viral models of KSHV biology and infection.